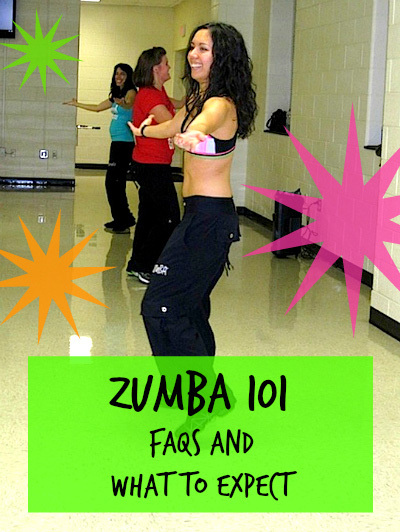 Zumba 101 – What Is Zumba and What to Expect? Have you heard about the hottest cardio workout around – ZUMBA!? If you’re interested in trying a Zumba class but want to know more first, read on for some Zumba 101 questions and answers. Zumba is a Latin-dance inspired fitness. Zumba is also called “exercise in disguise” because you’ll get a great workout, but you’ll have FUN, too. Expect a high-energy, cardio workout to upbeat music with plenty of booty-shaking. In more traditional dance classes, you may learn a choreographed routine with many different steps. Zumba choreography is typically pretty simple. Usually in Zumba, you’ll do the same moves or set of moves for the chorus and then a new set for the verse, but repeat the chorus-moves each time the chorus plays, etc. Zumba choreography is supposed to be so simple that anyone can do them without any experience, so if you’re on the fence about going to your first class, do it! Zumba instructors have a lot of freedom in their choreography, so some classes may be more complicated than others. You can get an idea of choreo and also the variety in instructors by searching YouTube for Zumba choreography. Here’s a YouTube playlist of some of my favorites. Anyone! You don’t have to have a dance background to do Zumba. Also, I’ve seen men and women of all ages in Zumba class (though you will have to gauge your personal situation as far as health level and ability before trying a new exercise of any kind. You may also wish to speak to your doctor or health care provider). Wear anything you’d normally wear to a cardio style class: comfortable clothes and tennis shoes (plus a sports bra for the ladies). Most people wear pants and t-shirts or tank tops with sneakers. You can also get some cute Zumbawear online at zumba.com. I talk about my favorite picks over on my Zumba page (and also in other blog posts – click to view). Water – definitely water. A hand towel may be a good idea, too. I personally also like to bring a post-workout protein shake/snack. Do you get a good workout with Zumba? Zumba is an excellent all-over, cardio workout. I’ve even heard Zumba can be good for your core. Additionally, I’ve seen different web-sites online claiming Zumba can burn 600-1000 calories per hour! I’ve measured myself using a heart rate monitor (this one). I use it more as an estimate, but it usually puts me around 700 calories burned per hour. How do you get the most out of your Zumba workout? If you want to get a maximum workout, don’t do the moves halfway. Do them like you mean them! Really doing Zumba and sort of doing Zumba is like the difference between jogging and running. You’re essentially doing the same move, but you’re not going all the way in one version. You should always do your workouts to your own preferred intensity level and make adjustments where needed (based on fitness level, to account for injuries, etc.). This is just a general suggestion to do what you can. You can find classes online at Zumba.com. You can also purchase DVDs if you want to do Zumba at home, but I highly recommend going to a group class because the group energy can help make the experience extra-awesome. You can find DVDs on zumba.com. Dance like no one is watching – I very much remember my first Zumba class. I remember strategically placing myself in the back of the class so there would no one behind me watching while I made an idiot out of myself. As I came back, I learned a few things: the instructors mess-up, too, and that’s ok AND most importantly, that most people in class are so flippin busy trying to figure out what the instructor is doing, they are probably not watching you! Ask your instructor for tips before/after class – Zumba instructors are very nice, fun and helpful. If they did a move in class that you just don’t get, ask them to show it to you after class. I’m sure they’ll be thrilled to help you and when you nail the move in class, you’ll feel like a rock star. Have fun – Zumba is exercise in disguise. It’s a workout hidden in a party. So cut-loose and enjoy yourself. You’ll get a better workout if you let go, too. Dance near the front – following the instructor is much easier if you can actually see the instructor. And remember, it doesn’t matter what the people behind you think – see my first tip. That’s it. I could write more, but really the first tip is IMO the most important. Disclaimer: Always workout to your own comfort level and ability. Be sure to consult your physician or health care provider before attempting a new exercise program. This advice isn’t meant as tailored health advice but more a general guideline. Have any more Zumba questions? Email them to me at thechiclife at gmail dot com. Also, Click here to read about my personal story with Zumba. which includes my favorite songs, Zumbawear, why I love Zumba. Great post! I LOVE zumba and I’m hoping to get certified as an instructor as soon as I finish my thesis! I typically do zumba 4-7 times a week and burn between 500-600 calories per 1 hr class! Your such a Zumba queen, I love your enthusiasm and passion for something you love. By the way your also looking very fit, nice job. Thanks for sharing! I am yet to try a Zumba class – but it sure sounds like a lot of fun. I went to my first Zumba class on Sunday – it was amazing – I can’t wait to go to the next class!! I love Zumba! I take 5 classes a week and if my schedule allowed for it, I would take more. You look like a super-cute Zumba girl! I love Zumba. It was also great seeing you in class the other night and leading us in a new song! AmericanHealthJournal is seeking partners in the health field. AHJ is a medical content site with over 3000 of high quality health care videos. We are seeking webmasters who are interested in featuring our videos. We can offer content exchanges, link exchanges, and exposure to your website. Come contact us at our contact form on our web site. Great write up, I am gonna start zumba classes by this new year so reading blogs and articles before going 😀 it seems I will enjoy my experience.